Meghalaya Public Service Commission has issued employment advertisement for filling up 228 Assistant Engineer, lecturer & LDA Vacancies. Applicants who are searching jobs for Meghalaya PSC Recruitment 2018 can apply online. Interested and eligible candidates can fill online form either here or official site. Apply Online for Meghalaya PSC Jobs is available from 17.04.2018. 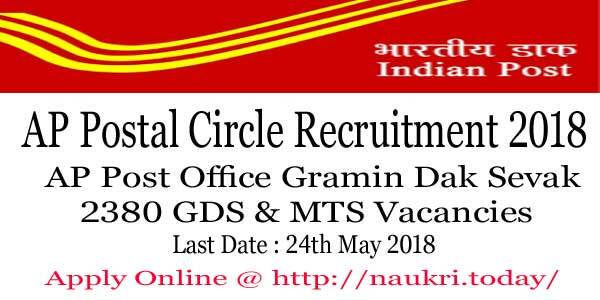 Applicants who are going to apply may fill the online form till last date 31.05.2018. Furthermore, information regarding Meghalaya PSC LDA Vacancy are mention on below section. Meghalaya Public Service Commission is inviting online application for 228 AE, LDA, Lecturer & other vacancies. The notification of Meghalaya PSC LDA Jobs is mention on below section as well as official website. The online registration already started. Applicants can apply online either here or official portal. More details regarding Meghalaya PSC Lecturer Recruitment like eligibility criteria, selection procedure, how to apply and others are mention on below section. How can I Check Eligibility Criteria Details for Meghalaya PSC Recruitment 2017 – 38 Civil Service & Junior Grade Other Post ? What Education Qualification Required for the Meghalaya PSC Shillong Vacancy 2017 ? What Application Fee For Meghalaya PSC Vacancy 2017 ? What is the Selection Process for Meghalaya PSC Recruitment 2017 For Civil Service & Junior Grade Jobs ? How I Check Pay Scale For Meghalaya PSC Jobs 2017 – 18 ? How I Fill Application form for Meghalaya PSC Vacancy 2017, Process of Applying Civil Service & Junior Grade Jobs Online form ? Candidates who wish to apply for Meghalaya PSC Recruitment 2018 must fulfill eligibility criteria. Applicants must require checking education qualification, age limit and other are mention below. Candidates must have Bachelor Degree or Master Degree in relevant Subject. Furthermore, information checks official Meghalaya PSC LDA Job Notification 2018. The age criteria & relaxation is decided as on 01.12.2017. Applicants who are going to fill up Meghalaya PSC Recruitment online form should not be less than 18 years. The maximum age limit required 27 years. Upper age limit also applicable as per govt. norms. Applicants selection will be made for Meghalaya PSC Recruitment is given as follows. SC/ST candidates require paying half rate of given application Fees for Meghalaya PSC Jobs 2018. Fees will be payable either online or offline mode. Furthermore, details of Meghalaya PSC Lecturer Recruitment check official notification. After selection of candidates they will receive the attractive salary for Meghalaya PSC Lecturer Jobs. They will get salary between Rs. 9900/- to Rs. 45600/-. Post wise details of monthly salary refer official notification. Applicants who are going to apply for Meghalaya PSC Jobs may fill online application form. The registration form available here as well as official site. Before going to fill Meghalaya PSC Vacancy online form you must have valid email id, mobile no., scan copy of photograph & signature. How to fill Meghalaya PSC Online form you can follow some given instructions. First of all, go to official site www.mpsc.nic.in. Go to Online Registration link. Fill up your Meghalaya PSC Recruitment 2018 Online Form. Enter your personal & educational information. Recheck application form and then upload photograph & Sign. Submit you Meghalaya PSC Lecturer Recruitment online form. 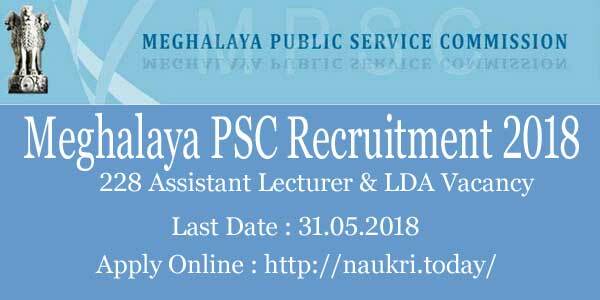 Conclusion : Meghalaya PSC Recruitment 2018 for 228 LDA, Lecturer & other vacancies. Candidates who are eligible may apply through online mode either here or official site. Meghalaya PSC Vacancy online registration will be closed on 31.05.2018. Furthermore, the information you require to read full article carefully. Department of Public Service Commission has released Meghalaya PSC Recruitment 2017 notification for 38 Posts of Civil Service (Jr. Grade) Vacancy. This is very good opportunity for the candidates who are looking for Job in Meghalaya State. Interested Candidates can apply for MPSC Civil Service & Junior Grade Jobs @ mpsc.nic.in through online mode. Applicants who are eligible can fill the Meghalaya PSC Online form in between 24.07.2017 to 31.08.2017. For more detail About the MPSC Recruitment 2017 Like Eligibility Criteria, Age Limit, Selection Process, Important Dates,Pay Scale, Exam Pattern etc. see below. About Meghalaya PSC : Meghalaya PSC is grated Recruitment Department of India. It was formed on 14 September 1972 and is going strong since then. here all Employees are Happy and Satisfied with working There and got good Salary per month. This is one of the fastest growing Organization in India. Full form of the Meghalaya PSC is Meghalaya Public Service Commission. Official Website of this Organization is www.mpsc.nic.in. Full Details For Meghalaya Public Service Commission Recruitment 2017 notification. Minimum age of the candidates for Meghalaya PSC Recruitment 2017 should be 21 years & Upper age must be 27 years as on 01.01.2017 for Civil Service & Junior Grade Bharti. Relaxation in age for SC/ST/OBC/ESM/PWD candidates will applicable as per Department Rules & regulation for MPSC Recruitment. Candidates must hold a Degree from any University incorporated by an Act of Parliament or State Legislature in India or any recognized Foreign University. and also must have professional and technical qualifications which are recognized by the Government as equivalent to professional and technical degree. Applicant can visit the official website for get more information about the Meghalaya PSC Bharti 2017. Applicants are inform that Application fee of Rs. 460/- paid for Meghalaya PSC Recruitment 2017. This Examination fee will be paid through the MPSC Challan. 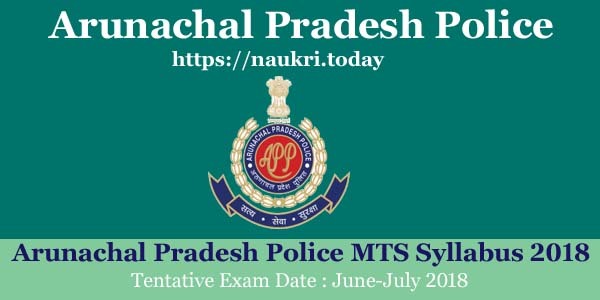 Candidates have must attached the copy of challan with the MPSC Application Form 2017. SC/ST Candidates which belong from the Meghalaya they have to pay only 50% of Application fee. PWD candidates will be exempted by Registration Fee. Applicant can check Meghalaya PSC Recruitment 2017 Notification 2017 for get more information about the Required Qualification details FOR MPSC Jobs 2017. Selection process will be based on Preliminary Examination for MPSC Civil Service & Junior Judge Jobs 2017. applicants who must cleared in Prelims Exam they will be Allowed for attend main Examination. Application form for Meghalaya PSC Exam will ne declare inn the Month of April 2018. Know More Details About the MPSC Recruitment 2017 Visit Official website of MPSC Vacancy Notification 2017. Selected Applicants will be paid Good Salary per month on Meghalaya PSC Bharti 2017. which is Mention in Upper Table. Applicants first of all log on to the official website www.mpsc.nic.in. Now click on Recruitment Section and click on Meghalaya PSC Vacancy Notification. Read All information Carefully which is Mention in the MPSC Job Notification. If you are eligible then Click on the Meghalaya PSC Recruitment 2017 Apply online link. Fill all required information form properly. Upload your recent passport size photo and signature in MPSC Application form. Attach Application Fee Challan with Registration Form. Take print out of MPSC Application form for future use. Conclusion : – Meghalaya PSC Recruitment 2017 for 38 Civil Service & Junior Grade Jobs. candidates can fill online form for Meghalaya PSC Vacancy 2017 on or before the last date that is 31st August 2017.